The controversial budget sparked fury from the EU, with European Commission President Jean-Claude Juncker even suggesting the Italian budget may lead to similar debt crisis faced by Greece. 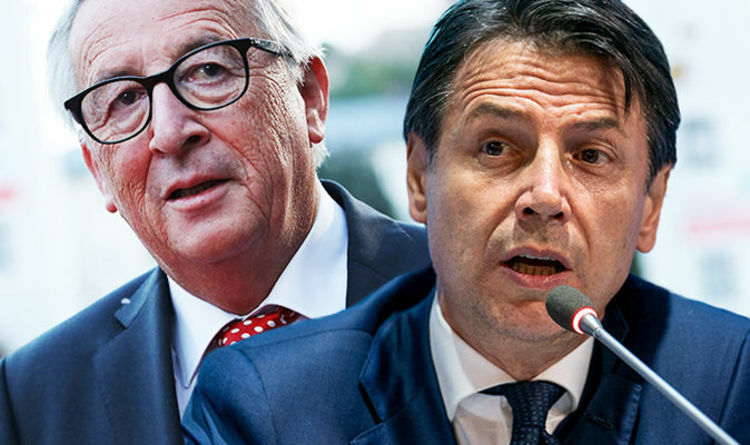 The IMF have now spoken out in favour of Brussels, as the international organisation warns Italy the budget is crucial to the stability of the entire eurozone. Italy’s debt is already the second highest in the eurozone as a share of economic output after Greece, at about 131 percent of GDP. The eurozone sets overall targets of 3 percent annual deficits and commits countries to move toward 60 percent overall debt. Mr Obstfeld, chief economist for the IMF, said: “Our concern about Italy is that there is a real imperative for the fiscal policy to maintain the confidence of markets. “And we have seen the spreads increase over the past months. “This has certainly contributed to our downgrade of Italian growth and makes the economy more susceptible to shocks. Global stock markets tumbled on Monday, while Italy’s borrowing costs surged by as much as 30 basis points to a four-year high. It comes after Deputy Prime Minister Matteo Salvini branded top Brussels officials the “enemies of Europe” and accused financial speculators of banking on “the failure” of his country. Mr Salvini, leader of the nationalist League party, attacked the European Commission and its senior figures and pledged to use next year’s European elections fight back with a populist “front of freedom”. He said: “Those who want to speculate on the Italian economy should know that they are wasting time. “We are against the enemies of Europe — Jean-Claude Juncker and Pierre Moscovici — shut away in the Brussels bunker. Rome is due to submit its draft budget by 15 October, which will then be poured over by EU officials to check whether it abides by their rules. The commission has warned Italy’s government, made up of Mr Salvini’s League and the anti-establishment Five Star party, that its budget plans will break eurozone spending rules. The Italian government has already pledged to reduce the headline deficit to 2.1 percent in 2020 and to 1.8 percent in 2021.